1) Mix all dry ingredients together and add milk, mix to form a dough. Add butter and knead to become smooth and elastic dough. Place dough into a big bowl, cover with cling wrap and let it proof for about 50-60 mins till double in size. 2) Knock down the dough, rest for 10 mins. Divide dough into 60g each, roll into ball, rest for another 10 mins. 3) Roll out the dough into rectangular shape, the width should be around the same as the length of hotdog. Cut a few strips half way till the bottom, each strip is about 1cm apart. Place hotdog on top, roll down from top. Place the hotdog roll on greased or lined baking pan, strip side facing up. Cover with cling wrap and proof for another 40-50 mins till double in size. 4) Egg wash and bake in preheated oven at 180C for about 15 mins till golden brown. Did you notice my signature at the end of the post? A BIG thank to Anncoo for helping me to design this lovely signature. Anncoo has also given me a lot of advices and assistant for my blog makeover. Once again, Ann, thank you for your generous sharing and thoughts. hi angel, for a staright dough method that can maintain its softness till the 3rd day, it's considered very good! 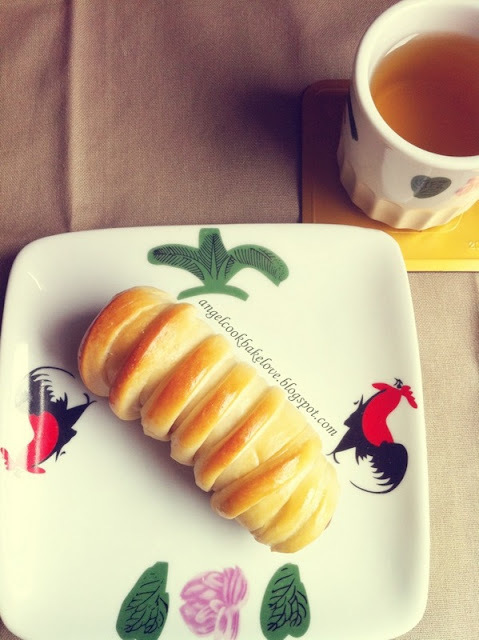 Your rolls really look like a caterpillar, a beautiful caterpillar ! Thank you for ur compliment. On the third day it is slightly dry but is still acceptable to me. i love new look of your blog, simple and clear..Oh, Ann has designed a nice signature for you. Homemade bread always the best! Hi Angel, nice caterpillar bread, I'm very sure the texture is fine and soft. Thanks for sharing. Thanks for dropping by my blog and ur lovely comment. Thanks. You shall give this recipe a try. I love the look of the bun. Yeah, like caterpillar, the kids will love things like that. Me too! haha I think adult will like it too! Hi Angel, your straight dough method caterpillar buns look really yum. May i know how many buns can be make out of this recipe ? Between I like your rooster square plate very much. Look really nice! If I remember correctly, I think I made 13 buns. Hi angel, tried yr receipe for the first time & it worked! 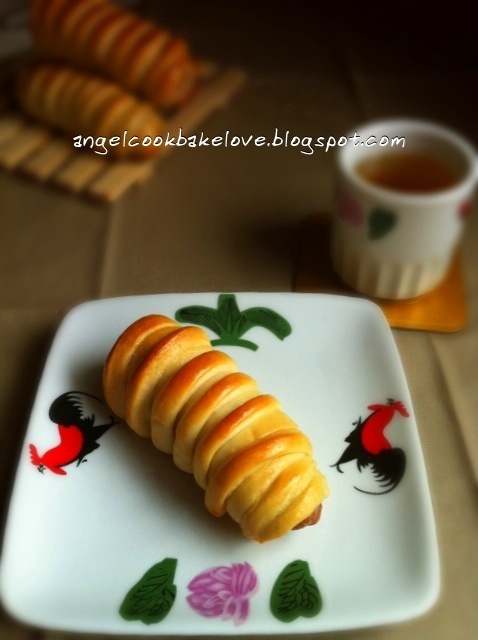 Tnx for sharing this simple & yummy sweet sausage bread receive! You are welcome! Glad thst you like it. Please remember to leave your name in your comment in future. Thanks. Hi! I tried your bread dough recipe today and the bread baked out super fluffy and soft! It was so beautiful and yummy! I made the bread with different stuffings and shapes, but it all turned out so awesome! Thanks for the recipe !